Take a little step back in time. Immerse yourself in a heady mix of music and dance guaranteed to make life sparkle. 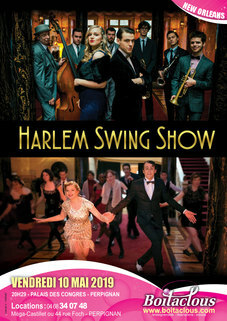 Concocted by the Galaad Moutoz Swing Orchestra, the “Harlem Swing Show”, is a magical cocktail featuring a pianist, a diva, an orchestra, two couples of dancers, and, above all, an energy that will leave you breathless. But be careful; this wild, generous and explosive jazz will irresistibly draw you into America of the Roaring Twenties and the risk of addiction is high!